As a photographer with a predisposition for photographing heavy industrial and construction projects. 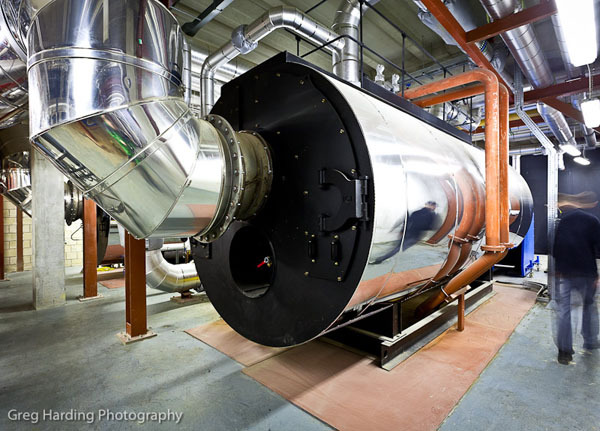 Plant rooms have always offered the opportunity to create high impact images that feature insulated pipes, beautiful chromed boilers, sleek looking pressurised systems, oh and big industrial engines. O.k, it’s fair to say I’m still a big kid at heart, imagining that I’m playing with industrial sized Mecanno. Well, at MediaCity UK they have some pretty sophisicated Meccano sets. MediaCity UK is now seen as the creative hub of the North West if not the UK and as a commercial photographer involved in architecture and construction, I’m attracted to the newly built BBC home in Salford Quays for it’s dominant architecture, bold colour palate and beautiful shipping canal location. The area holds some amazing opportunities to create stunning photographs that not only capture an essence of Manchester’s strong industrial past, but that are juxtaposed against the background of future media innovation. What intrigues me when seeing a sprawling metropolis like this is imagining what happens behind the scenes to keep the whole thing going. Such an opportunity cropped up when I photographed the Energy Centre at MediaCity. I was interested in capturing the ‘state of the art’ Tri-generation system and for those of you not familiar with the Tri-Gen concept, here’s some background information about the Energy Centre as supplied by Peel Utilities – Frank Welsh. Once in the Energy Centre I was given a quick introduction to the plant and walked around to get my bearings and scope out the photographic opportunities. One immediate issue was that although the centre was very large, the plant (boilers/chillers/generators) had been installed into tight concrete-walled spaces and whilst adequate for access by service engineers, from a photographic perspective it was extremely tight. Wide angles would be the lenses of choice today. My choice of angles was seriously compromised and being able to get a clear shot on any piece of plant was going to be almost impossible. I pressed on and even broke out some lights to add a little colour to what was a pretty monotone palate. Click on the main picture above to see a few more images from the shoot. I’ve include a quick BTS video taken from inside the rather noisy Energy facility. I took a small amount of video footage, but the ambient noise was too high to provide anything worth watching. This was the best i could manage on camera without a seperate sound crew. Apologies for the production quality. I hope you like the industrial shots of the Energy Centre and feel free to post a leave a comment. To see more construction/industrial photography please visit here.